Francis Bacon is usually credited with first delivering to us the notion that ‘knowledge is power’ in a collection of religious meditations published in 1597 entitled the ‘Meditationes Sacrae’. Apparently Volkswagen agree. Of course it’s difficult to imagine what the 16th century English philosopher would have made of this bold endorsement by one of the world’s largest automobile manufacturers. Perhaps, given his strong ties to the early empiricist movement and influential role in the development of experimental science, Bacon would have taken great pride in the show of technological prowess implied by the billboard advertisement. Regardless, it seems somehow unlikely that the creative mind behind this campaign was principally concerned with the philosophical origins of its core sentiment. Even less so that Volkswagen’s intended audience should be restricted to a relatively small, albeit international group of distinguished Bacon scholars. So, what is the claim that ‘knowledge is power’ really doing here. The answer, it seems to me, lies in the question of what kind of power is being touted. For Bacon, the claim that ‘knowledge is power’ can be best understood within the context of the scientific enlightenment of his day. He was deeply influential in the establishment of empirical methods in the sciences and in promoting the idea of scientific and technological progress on the basis of these methods. It was, therefore, advances in our knowledge of the natural world that represented for him a previously unrealised and unwielded power. To an extent, this is precisely the kind of power that Volkswagen are keen to appeal to. In the image above the slogan, the car’s reflection is covered with a series of complex mathematical equations suggestive of the extensive technical understanding that is presumably required in the design and construction of an automobile. Drawing our attention to this fact is Volkswagen’s way of highlighting just how clever their cars really are. And that’s the interesting part. According to the manufacturing and marketing teams at Volkswagen, it is the knowledge that has gone into the development of this new model that renders it desirable. Power, it is assumed, is something that we want and knowledge is a manifestation of power. As long as we identify power with knowledge and knowledge with Volkswagen, then buying Volkswagen gets us something we desire. Of course the assumption that power is what we want is playing an essential role here and plenty of worthwhile analysis could be undertaken with respect to that premise. However, whilst I am wearing my epistemologist’s hat it is the role that knowledge is playing that interests me most. At first glance, the appeal to knowledge is evocative of Bacon’s original sentiment and the seemingly unlimited potential of scientific and technological progress. But this is an advertising campaign and as such another level of analysis is required. The aim of this campaign is not to tell us something about how tricky it is to construct cars. At least that is not the ultimate aim. The point is to sell them. In this context then, a new answer emerges to the question ‘what kind of power is knowledge’. It is not only our knowledge of the natural world and the power of scientific progress that is being employed here, nor is it the power to manufacture ever faster, safer and sexier cars. 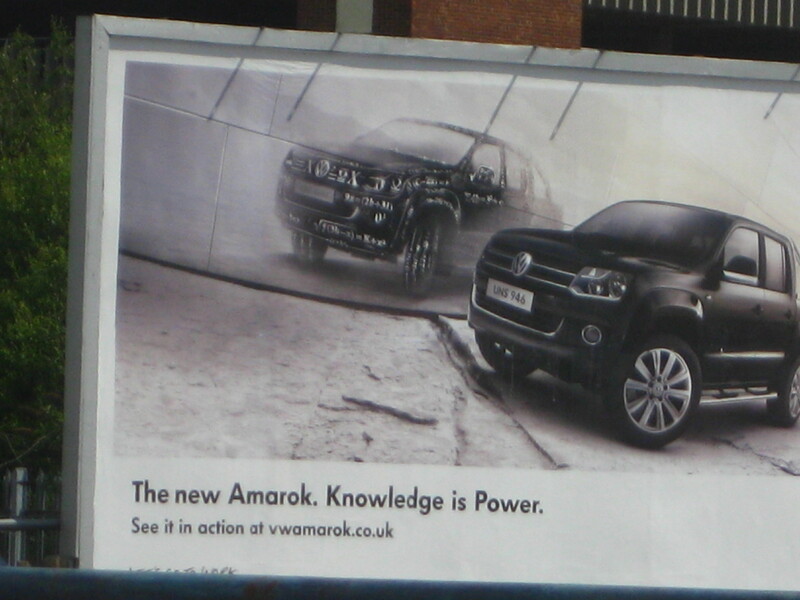 For the marketing teams at Volkswagen at least, knowledge is selling power. And we have been sold. 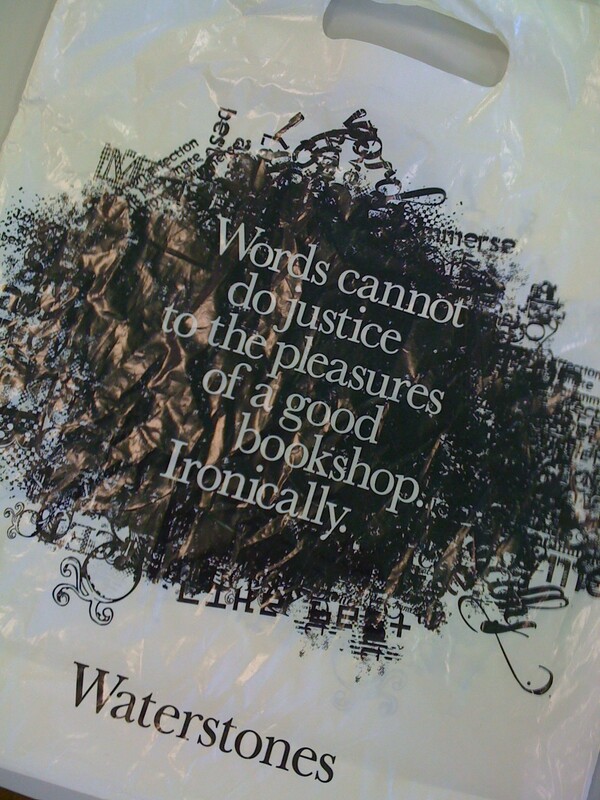 As the marketing team responsible for this recently acquired Waterstones bag are presumably well aware, there is for many a distinctive sense of awe associated with the experience of browsing through the shelves of a well-stocked bookshop. For my part this has at times been little short of overwhelming; a kind of sensory or cognitive overload that leads to the impulsive purchase of whatever I happen to be holding at that moment and an abrupt exit in the company of a mild headache. Maybe that’s just me. Regardless, it is still one of my favourite things to do. However, this relatively recent promotional push for the pleasures of the bookshop, undoubtedly prompted by the steady rise of the eReader, did have me wondering where exactly this sense of awe comes from. And what it represents. The experience, for me at least, is one of sheer amazement at just how much there is to know. How much thinking has already been done and how ignorant I am of its contents. It is this that brings on the headache. And once again, the bookshop marketing teams are quite uncannily aware of my predicament. The latest strapline from Blackwell’s has the bookshop confidently pronouncing itself to be ‘The Knowledge Retailer’. A form of aspirin for the easily overwhelmed. Upon reflection though, I find the sentiment in this context somehow disconcerting. The Blackwell’s marketeers have seemingly infiltrated the private space of my subjective experience and are using the sense of awe I feel to sell to me the very thing I am so acutely aware in that moment that I lack. Knowledge. Of course, it is the job of an advertising slogan to target consumer desires and promise their immediate satisfaction. The same can often be said of products themselves; think anti-ageing serums and energy supplements. That’s not to say these products don’t deliver on the pledges that are made, perhaps they do. But there’s no denying that an ulterior motive is at work. And this is just as true in the case of the Blackwell’s strapline as in the promotion and retail of any other good. Except that here knowledge itself is the product being sold; knowledge has been commodified. As an epistemologist, this gives one pause for thought. The concept of commodification is most commonly associated with the 19th century philosopher, economist and sociologist Karl Marx. According to the Marxist framework, commodities are objects produced by human labour that satisfy human desires and needs. They are, moreover, the fundamental units of a capitalist economy. 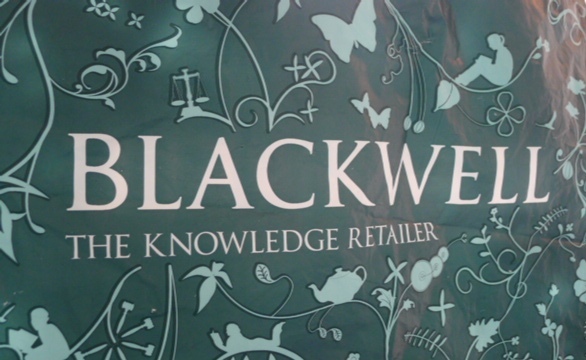 The notion that knowledge is one of these units could not, I think, be more evident upon considering the Blackwell’s strapline. Knowledge is quite literally for sale; a good to be bought and retailed at market value according to its utility. It is the commodification of knowledge then that has, in my view, a somewhat disconcerting effect on the experience of bookshop awe. I am as ignorant as ever, there is still so much to know. But at least, if I have enough money, I can buy myself that which I lack and leave with a plastic bag full of the stuff. Instead of a headache. As an economic system, capitalism flourishes on the basis of the intense accumulation of commodities. It thus relies in part upon the continued accumulation of knowledge, not as a human good in itself but as a necessary feature of economic growth. This naturally has implications for discussions concerning the value of knowledge (examined in a forthcoming post). More generally however, the commodification of knowledge would seem to have an intriguing impact on epistemology itself, an area of philosophical inquiry often considered deeply and perhaps frustratingly theoretical. Marx argued that the concept of commodification exhibits an inescapable and inherently social dimension. This arises from the necessity of the exchange that takes place between those who produce commodified goods and those who come to own them. If this is so and if knowledge is itself a commodified good then the concerns of epistemology must also inherit this social dimension. Epistemologists should thus take as fundamental the question of the societal nature and value of knowledge. The Blackwell’s strapline serves to demonstrate that the concept of knowledge is far from exclusively in the hands of philosophers and nor presumably should it be. Epistemologists may then rightly concern themselves with the proper role of a commodified knowledge in a capitalist society. In which case, one can argue, as Marx does in the opening assertion of Das Kapital (1867), that “[O]ur investigation must therefore begin with the analysis of a commodity”.